We’re back in Maui to check on experiments and collect data. This round, fellow labmate Clint Edwards has joined me & it’s been a great adventure. We’ve been working hard and playing hard. 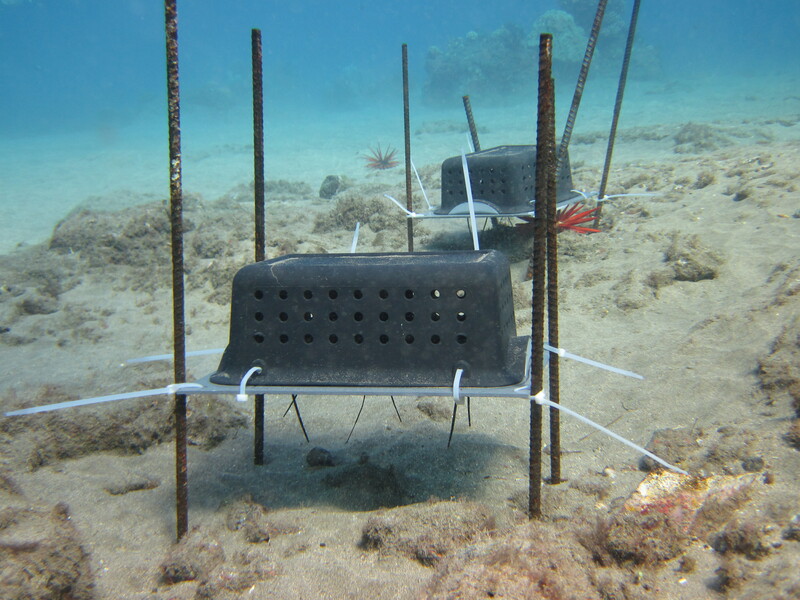 We have an in situ (in the field) experiment that explore the rates and preferences of herbivorous sea urchins in Hawaii. Why you ask? Urchins are important consumers of algae on tropical coral reefs. Without urchins, algae may grow unchecked and smother the corals that build reef environments; and that’d be bad. We know urchins are important in general, but there are 6 common species of herbivorous urchins in Maui’s reefs and we’re trying to figure out whether they all serve the same functions or perform complementary functions in reef systems. 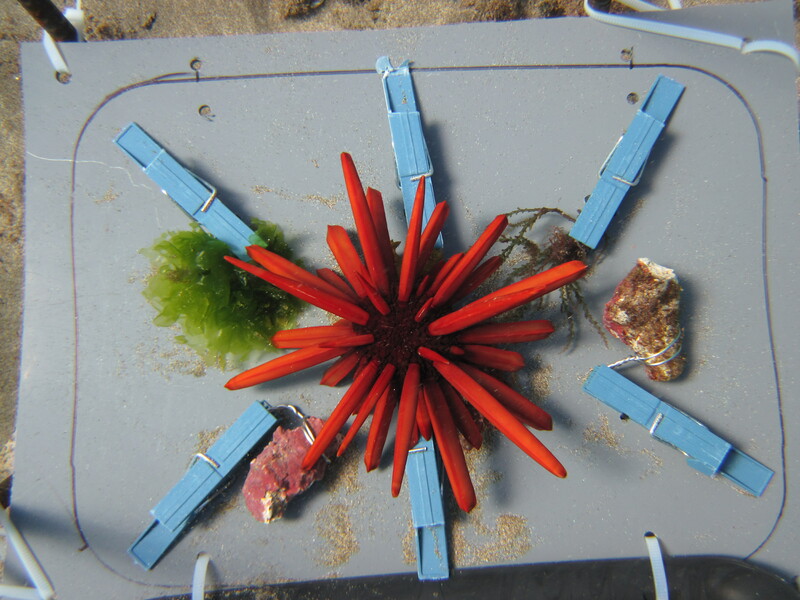 So, we collect them, use grazing assays or “urchin prisons” as Clint calls them, and provide a smorgasbord of algae to observe what and how fast they eat. Pretty simple concept, but not so easy to to execute as you can see. We also ventured out with a couple of cohorts, Don & Mark, to use UV lights to capture Fluoresceine die oozing from some previously labeled wastewater seeps. We weren’t sure what we would find; and we were shocked to find an amazing psychedelic light show on the new moon. In addition we were surrounded by a wonderful array of wildlife; most notably, a moray eel tearing into the flesh of a freshly-captured brown tang. For the Maui nightlife, one might expect liquor, dancing, feasting, & light shows. Well, we found liquid, dancing, feasting & light shows; albeit, all submarine. Not too many undergrads can say they have been fortunate enough to do research. Even fewer can say they’ve been a part of research going into their junior year. And just about one can say he’s been able to be a part of collaborative research between Moss Landing Marine Laboratories (MLML) and Scripps Institution of Oceanography (SIO). My name’s Alex Neu and I’m that undergrad. I’m heading into my junior year this fall at California State University – Monterey Bay. This summer MLML grad student Emily Donham and I are spending our summer researching the effects of climate change on temperate rocky reef communities here in La Jolla as part of a CA Seagrant project funded to co PI’s Dr. Scott Hamilton (MLML) and Dr. Jennifer Smith (SIO). Our project includes studying the differential effects of increased CO2 on calcifying and fleshy algal species. Currently we are working with 2 fleshy local species, on that is native and one that is invasive. This week marks the half way point in our first round of experimentation and we are all excited to see what kind of results we’ll find at the end of the month. Will one species fair better than the other? What sort of implications could this have for an invasive species’ ability to outcompete a native in a changing oceanic environment? Individual algal speciments being treated in the wetlab of Dr. Jennifer Smith at SIO. Our day-to-day activities here include monitoring pH levels in each of our samples, taking water samples from randomly chosen jars to monitor carbonate chemistry, and general upkeep of the wetlab and our electronic data recording systems. We have also done some collecting of crustose coralline algae (CCA) for identification and potential use in future experiments. I have even learned how to do herbarium presses, which are a way of preserving algal specimens by flattening and drying them (apparently Plocamium cartilagineum is everyone’s favorite algae to press). Thanks to the Undergrad Research Opportunities Center (UROC) at CSUMB, SIO, and MLML for making this research opportunity possible!